Before we jump into all the “fun” work I’ve been doing in the basement for the last six weeks, let’s do a post to go over our game plan. Budget is the biggest driver for the project. We have zero money frankly, but as I said in the last post: we feel strongly that we need the space to be useful, otherwise what’s the point. Before the project the basement was full, no exaggeration, of “stuff”. Furniture, half filled boxes, years worth of stuff that had just been moved from house to house. For example, in our old house we had a library filled with books. There’s nothing like that in the new house, so there are just box after box of books. My wife collects board games and we’ve never once had a place to store and display her very extensive collection. I have every car magazine from 1986 to the early 2000’s. Yes, those can be recycled but I’d like to go through them first. Point is we have more crap than most of you combined. The basement has to stop being a big catch-all. Okay, back to design and our plans. Here are the main project areas. I’ll go over them in detail in subsequent posts. When we built the house, you may recall we used Superior Walls for our foundation. The basement walls are prefabricated out of cement and steel, and stand nine feet tall (9′). The walls feature metal stud facings so we can apply drywall directly to the face of them. No need to fir out the walls which saves a lot of time and money. I just need to frame in a few of the corners with drywall nailers. Note, we would also have to frame in for any shelf or cabinet supports ahead of time. Superior walls cannot support a vertical load so don’t go screwing in cabinets into the studs. More info, and to see nailer diagrams, click here. The foundation walls are insulated to R12.5 from that factory with blue rigid insulation. When we installed them I speculated that we would insulate them with another R-20 worth of insulation, which I think is the maximum if we fill the rest of each cavity with sprayed insulation. Well to keep costs down we did two things 1) only insulated the top 4′ of the exterior walls and 2) went to a depth of 1.5″ (R-10). Why? The top half of the wall has the most exposure to outside temperature changes. Once you get beyond 4-5 feet the earth’s temperature is pretty stagnate, something like a constant 50 degrees or something (I’ll let you look it up). By the way, cost to insulate the top 4′ with 1.5″ of 2 lb. spray insulation (R-10): $2,164. Three inches (R-20) would have been $4,040. The floors in the basement are cement (over 4″ of rigid foam insulation by the way). Our basement is prone to flooding if the sump pump ever fails, so that drives many of the design decisions we’ve made in regards to our basement project. Long term our plan would be to cover the entire 950 sq. ft. of living space with ceramic or porcelain tile. Short term though we’ll leave it cement. I’ll rent a floor cleaner from Home Depot and clean the cement myself. Not sure if I’ll seal it at this point. I’ll decide when the time comes. We could stain the floor like we did in my studio. That is always an option, in lieu of putting tile down. For now though regular concrete will suffice everywhere, though the bathroom will likely get tile right out of the gate. Cost should just be a few hundred dollars for cleaning and any tile. There is some debate whether to put in a drywall ceiling or suspended ceiling. Drywall is cleaner and more finished. Suspended ceilings give you access to HVAC, water and electrical. If you think about it, the other floors of the house are covered in drywall with no utility access. So I think drywall is a fine choice. The problem with our ceiling is there are a lot of pipes, ducts and other obstacles that I don’t want to, or can’t, soffit around. We’ll be putting a drop ceiling in all the living areas except the bathroom. Armstrong has a wide selection of ceiling tiles and a lot of inspiration shots on their website. I got a quote for installing a generic Armstrong system: $3,500. I’ll do it myself. Hopefully the material cost will be closer to $1,000-$2,000. We may hold off and do this next year if we can’t afford it. The yellow areas will likely be drop ceiling. Because of the potential for water flooding should the sump pump fail, I was hesitant to use wood framing. If the basement flooded there’s potential for mold to grow in water-logged studs and walls. Regardless always put down pressure treated sole plates, but I didn’t feel like using treated studs. I was curious about metal framing so that’s what I went with. I still used wood for soffits, blocking and ceiling areas. Look for my thoughts on metal framing in a future post. Cost wise we got an estimate for $1,791 to have someone else do the framing. I did it myself, learned a new skill and spent about $750 on materials to partition the basement. By the way, this includes material for desperately needed storage shelves in the storage room. I don’t do electrical so we’ll have to hire a pro. We’re doing the bare minimum. With the drop ceiling and good access from the storage room we can add-on later. For now it’s all switches, outlets, and ceiling cans. I’d like to swing for 4″ cans but may just default to 6″ to save money. Would like to populate them all with LED bulbs though. Cost estimate for electrical parts and labor is at $4,000. Yikes! We’ll drywall everything. I may put 12″ of cement board at the bottom of every wall because of the aforementioned water damage potential. Or not. Estimate we got was $3,757. Doing it myself will hopefully save some money. But I don’t have the patience or craftsmanship (or desire) to mud it all so I may have to source that. $4K electric, $2K insulation, $1K framing, $3K drywall = $10K, then do the ceiling next year or down the road maybe. We’ll see. I just hand over receipts and the wife keeps track and cuts checks. Stay tuned for future posts on each step of the way. As of this writing I’m wrapping up framing and the insulation is done. I spent this weekend working on my office cabinet project. The goal was to frame the two walls so that I could call the plumber and get the sink pipes extended. All went well I can safely report tonight. I even got a bonus project done with my free time on Sunday. Before I go into the play by play, I’ll share something with you; throughout the process of building the house it seems a lot wasn’t going as well as planned. As I work on each subsequent project, I have found that if I take my time, think things through and remain calm these projects are going easier. And they don’t seem to take much longer (compared to just barreling through them), so there is value in taking my time. Knock on wood of course. The walls I’m building are add-ons so the first order of business is to get some solid nailing blocks in the existing exterior wall. If I was smart I’d have had a “pocket” framed into the wall when we were rough framing the house, before the drywall went in, but realistically I wouldn’t have been able to devise where the pocket should be so the chances of getting it right back then are slim. I spent some time marking out the location of my wall, taking into consideration my already made countertops, cabinets and even factoring in the existing steps in my studio. Once I was comfortable with my marks on the wall I used my oscillating tool to remove the drywall and create two horizontal openings. I devised my game plan on the fly and am fairly happy with it, looking back on my handy work. The plan was to install two 2×6 blocks, anchored between two existing wall studs, to provide a solid anchoring for my perpendicular wall. After the drywall was off I scraped away the insulation inside. Our insulation is made from recycled newspaper that was “damp” blown into the wall cavities. Suffice to say I had to “scrape” some off to make room for the 2×6 blocks. I then inserted the blocks and worked them down behind the drywall. See the pics for my trick on getting a grip on the blocks. I came up with that after scratching my head trying to figure out how to get the block into position. The insulation, drywall and studs had a firm grip on my block so snaking it into place was tough, but the trick made it do able. Once in place I mounted a 1/2″ block which I’d eventually mount the new wall stud to. Finally I replaced the drywall pieces I’d cut out earlier. Ha, after about two hours everything looked basically like it did when I had started. But I knew I could now start building my walls. I cut a couple treated 2×4’s, covered their underside with adhesive caulk, and fastened them to the studio’s cool cement floor with blue colored masonry screws that I picked up at Lowes. I then cut all my studs, to about 98″ and mounted the first one to the exterior wall, screwing into the 1/2″ blocks and ultimately the 2×6 blocks I’d hidden behind the wall hours previously. I used screws and a drill for the entire project. I don’t have a nail gun and hand nailing is fairly quick but laborious. Screws seemed to work just fine and I had a lot left over from other projects that I could use on this job. Once that first stud was up I continued putting up the rest of the studs and finally the top plates. The design I came up with meant that both walls would stop about a foot or two from the ceiling. I capped the wall design off at the top of the upper cabinets. This created that open air space above the cabinets which will help keep the art studio feeling airy. One bad thing with the design is that the walls are only attached to the floor and the one exterior wall so they’re prone to wiggling. I nailed a filler board down low at the end of the one wall, where it meets the steps, and this helped stiffen and level the wall. Putting in the new floor framing extension would stiffen the walls more. Finally the drywall, cabinets and shelving should stiffen everything up as well. One pesky task that I decided to tackle during this project was the “hidden air vent” buried under the office platform. I knew it was there ’cause I had photos. From what I remember it was there and no one ever hooked it up during construction. They just built the platform over the top. I’m not sure why. I’m sure it sat there untouched, with some blue foam stuffed in it from when they poured the concrete floor (the foam kept the cement out during pouring). My concern was that the blue foam may have been pushed down into the air duct and was causing blockage, or maybe conditioned air was leaking into the cavity under my office. Either way I wanted to fix it and possibly route the vent into the floor of my office and finish it off. I started by prying off the drywall that capped the platform. The platform is only about 14″ off the ground which meant that the 2×6 joists left only like 9″ of vertical space underneath the platform. Ugh. After finding a real flashlight (my boys seemingly steal all of the working flashlights and hoard them in somewhere secret) I peered under to find a mountain of insulation. I guess when they blew the insulation in the wall cavities a lot of it exited out down here until the cavities were full. I chickened out a few times before talking myself into getting under there. It was the right thing to do. I crafted a cardboard insulation pusher on a stick and did just that, started pushing the insulation to the far side of the space under the platform. Based on the pic I shared the other day I thought the vent was way in there. I glance up at the exposed wall studs and decided to check my photo again; so I’d know how much insulation I’d have to push away. I was pleasantly surprised my sense of scale was off and it turned out the vent was about three feet in instead of eight feet in. This was great news cause being under there was like being in a coffin. And I was breathing heavy with the prospect of having to go way back into there. So I brushed away the insulation and sure enough, there was my vent. There was no way around it, I had to get in there. My head barely fit and then my fat gut and waist did not fit. Talk about hyperventilating…but with a twist I was in. The wife handed me tools and the vacuum hose like a hygienist helping a dentist. I pounded away at the cement overhanging the vent and carved away at the blue foam blocks inside. Pulling the last one out of the metal vent shoot I reached in….and much to my dismay….I found…..all was for nothing. They never cut the 8″ green air duct open at that vent. They must have never planned on finishing that vent. I could have just left it; I didn’t have to get all freaked out by the claustrophobic space, eat insulation or fish around for the vent. Oh well, knowing that nothing was wrong from an air flow standpoint outweighed any frustration I would have felt going through all these theatrics. Back to the work at hand then. I wrapped up the framing at this point by roughing in the “floor” extension. I just used 2×4’s and set it up for a 1/2″ piece of OSB board to cap it off. This area will just hold up the cabinets and should be plenty strong enough. 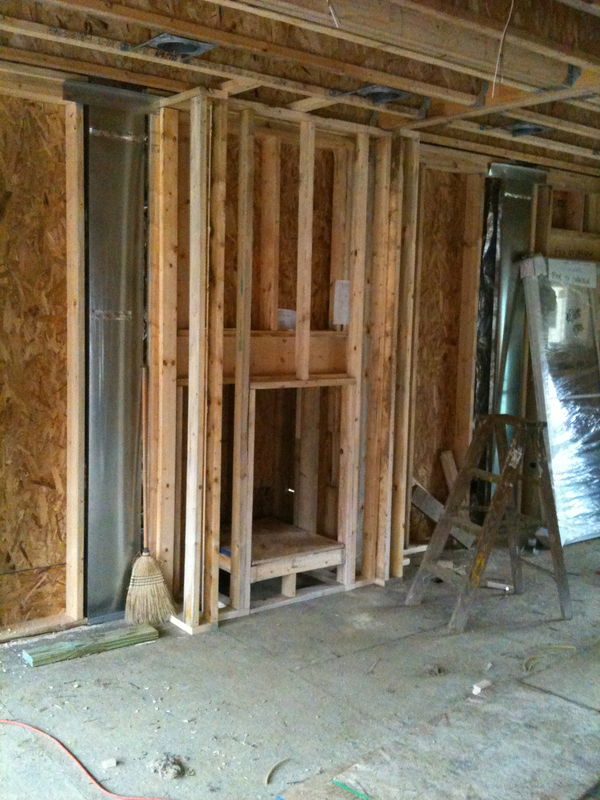 I’ll install the OSB and some 1/2″ flooring once the plumber is done extending the pipes. So that’s it for that project for now. With an hour to spare I decided to get the sink in Christine’s studio installed so the plumber could hook that up too when he comes out. We bought a small stainless steel bar sink, that included a faucet and drain for only $109 at Lowes. It was easy to install. See pics below for step by step. Ok, I’m exhausted and need my beauty sleep. Stay tuned, hopefully next weekend I’ll be doing some drywall. Just a detail shot of all the stuff intersecting in this corner: stair stringer, trim, wood floor, drywall deck and more. Using my oscillating tool to cut pockets in the drywall – easier than using the jab saw. I used the sharp flat end of a metal pry bar to scrape off a layer of insulation, to make room for my 2×6 block. I inserted 2×6 blocks into the pockets I cut into the wall. I drilled a 1″ hole and used a tool, inserted in the hole, to help position the block in place. Here you can see my helper tool….I have no idea what they are but these 6″ long “L” shaped metal brackets worked perfectly…I simply inserted them into the hole I drilled and this gave me some leverage in positioning the block. Here you can see I screwed a 1/2″ block in place where the stud will go. After all my hard work we’re back to square one, but now after carefully performing surgery on my wall I have two secure mounting points for my new wall. Barely looks like I did anything, but the two 1/2″ blocks give away the fact I’ve now got a secure mounting spot for my new wall. I used pressure treated 2×4’s for the sole plates of my two new walls. I used some nice masonry screws and construction adhesive to attach them to the cement floor. My first stud in place. Here you can see the first wall framed up. I purposefully left it short of the ceiling. Call it a night, I got the walls framed…. I invented this tool to sweep insulation out of my way under the office platform. Cool….there’s the vent I’m looking for…a lot closer to the opening than I thought. That’s me up to my navel in under office goodness. It looks more spacious than it was. Here’s the infamous vent! You can see some of the insulation I had to push out of the way in the right of the picture. The amount of working space here is in the ballpark of eight or nine inches of vertical space….basically like working in a coffin. Look at the bottom of the vent…that’s an eight inch diameter green plastic tube….that has NOT been cut out, thus this is a dummy vent….and I’m a dummy for having done all this for a non functioning air vent. I finish nailed a 1/2″ board between the stringer and stud, this gave me a chance to stiffen my wall and make it level. Here you can see I framed in the new floor. Need to wait for the plumbing to be extended to the endcap before I can put in the floor and drywall. Voila! I’m done framing my walls. I used the template that came with the sink to mark where I needed to cut. I drilled a 1″ hole to start then used a jigsaw to cut out the hole. Inserting the anchor clips on the sink flange. The clips are kinda cool….flip ’em back 90 degrees so the sink can be inserted into the hole. I caulked the drain before installing it. I applied a bead of caulk around the rim before dropping the sink in place. Today was pretty cool. Today I took a vacation day and worked on the house. Today I had the privilege of stepping into a time machine. I don’t know what it is, but for whatever reason I woke up at 4am stressing out about the house. My mind processing 10,000 things regarding design, to do’s, road blocks….on and on with no hope of getting back to sleep. When I did get to sleep again I was greeted with the “house dream” consisting of a massive house, executed nicely but with enough oddities to stress me out, even in dream mode. Next thing I know I’m transported to the present and I awake in a panic wondering what time it is. Damn it all to hell. Finally able to sleep but I’m late. Text shows my brother’s running late as well; enough time to scramble, throwing my circular saw into the Rabbit. The weather looks a thousand times better in that it shouldn’t snow today. Yesterday was a complete nightmare of wind and air turning to a crystalline vapor mist. Today would be dry. Today was my day. Today I was a cut man. I arrive on site to the pleasant surprise of several trucks and vans on site. Finally the trades were cramming to get their work done and get inspections going. I park the Rabbit on an embankment to the side of our driveway, suitable for the Jeep, not really for the VW. Propping the door ajar with my foot I grab a handful of the day’s requirements. One dash into the hatch to grab my saws and tool belt then up the drive to the house site. Looking at the house I admire its scale and proportions. They grow on me daily. My brother is getting out of his truck. We exchange pleasantries and walk inside. The electricians are hard at work; wires running seemingly everywhere. The radio is blaring classic rock and the smell of wood fills my nose. I set down my saws and swing my tool belt around my waist, fastening the plastic fastener in front. Not in back like the nerdy guys do in the handyman magazines or I suspect they do on ‘This Old House’; no offense to TOH, I’m really a huge fan. It’s just this is how I’ve always worn it. What is missing though is any semblance of a carpenter’s pencil. Rather I’m stuck with random ballpoint pen from my car. But not really. Because today I got to do something I haven’t done in a long time. And not to say I’m an expert at this, or anything for that matter, but for one day I got to do something I wasn’t too half bad at doing back in the day. Today the plan was to tackle some odds and ends. In the end we ultimately framed out the fireplace. The actual fireplace will go in next Friday so we needed to frame it out. Part will stick into the screen porch. The rest into the Family Room. After setting out the tools, extension cords and air hoses I manned my station. Two plastic saw horses that had seen better days but were secure and proud none the less. I loaded them up with 2×4’s and 2×6’s. For the next several hours my brother and I designed, schemed, cut and nailed until we had the framework that would eventually house our fireplace. I pulled the tree hugger card and made sure we had 8″ of rigid below the fireplace box and I even used the 2×4’s from the window packaging for the plates and platform joists. My cuts were the straightest but hey, it’s been a while. Afterwards we set the first door of the house, the one going to the screen porch. Meanwhile the roofers continued their march west. The HVAC techs, electricians and plumbers all made significant progress as well. And over in the Family Room was a 38-year-old guy transporting himself back in time. See, in high school and college my brothers took pity on my and let me work for them rough framing houses. I wasn’t the most adept at walking roofs or walls so that basically meant moving lumber. Eventually though I could man the saw; measuring, cutting handing up boards and sheets of plywood to the guys above, below or around so they could be nailed up. Sure I’ve nailed my fair share of boards so it’s not like I was one-dimensional, but the romance is being one thing or another, not necessarily a jack of all trades. For all intents and purposes. I was a self-proclaimed “cut man”. So for one day I got out of the office and I got to man the saw again, alongside my brother. He laughed because he said it takes a pretty special project (or a fair amount of money?) for him to come out of retirement, away from his cabinet shop, and fire up the framing gun. I’m pretty sure if I wanted to I could close my eyes or squint hard enough to transport myself back eighteen years today and not have been able to tell the difference. It was only for a handful of hours, but part of me had dreamt of it for a long time. And part of me knows that, aside from maybe one or two more days at the house, it’s a dream turned memory that will most likely never be repeated as long as I on this side of the horizon. The funny thing about time is it glosses over everything so much that the only things that shine through are the good parts, generally speaking. Framing was a nasty job at times and working to death in a corporate America cube is a lot better in most if not all regards. I’m not being mellow dramatic either. I have absolutely no desire to go back to that way of life or to even do much more manual work on my own house for that matter. But inside of me, somewhere, there’s a part that looks fondly upon the best parts of that old job. To visit, possibly for the last time, that time and place while working on my own house is pretty special. So as I reflect upon the existence that is my life at the, god willing, halfway point I’m ashamed that most of it is made up of selfish acts and actions. Maybe in a way this house can somehow be one selfless acts I somehow help leave behind. The reality is though I’m going to enjoy it as much if not more than anyone else so there’s not much selflessness about it. And the reality is I’m but one of dozens of people making this house a reality. At times a bit player at best I am. I like to think though on the off chance one of my sons wants to hang on to it or sell it they’ll either get a house that will have low overhead and was ahead of its time or they’ll make a pretty penny off it. When you’re me, this is as good as it gets. I can always hope and dream though. When my boys look back upon it, upon that house, somewhere back there in the shadows where memories and dreams dance, what they’ll see is their old man got to be a cut man one last time. And he loved every second of it.